Inaugural issue: Sangre Por Salud BioNews. 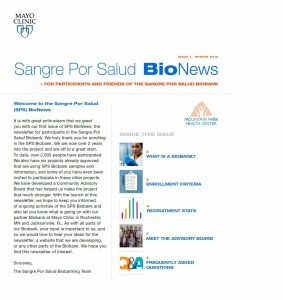 The Sangre Por Salud (Spanish for Blood for Health) Biobank was created to expand precision medicine research to underrepresented Latino patients in order to enhance the diversity of the Mayo Clinic Biobank. 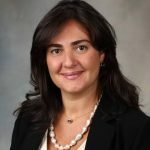 The biobank enables researchers to examine biological samples and data collected from Latino patients in order to develop better prevention, diagnostic tools and treatments for health issues specific to this group. Created in 2013, the Sangre Por Salud Biobank is a collaboration between Mayo Clinic Center for Individualized Medicine, Mountain Park Health Center in Phoenix, and Arizona State University. Mountain Park Health Center, a designated Federally Qualified Health Center (FQHC), provides comprehensive health care services to underserved populations, including minority, immigrant and homeless patients. This collaborative effort serves as a model for how precision medicine research can be extended to a broader community. 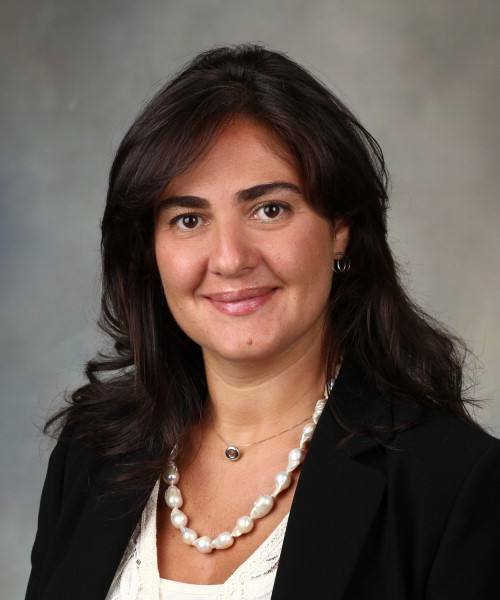 Eleanna De Filippis, M.D., Ph.D.
Read the full article about the Sangre Por Salud Biobank on the Mayo Clinic Individualized Medicine blog. Read article in Public Health Genomics: "The Sangre Por Salud Biobank: Facilitating Genetic Research in an Underrepresented Latino Community." To date, more than 2,500 Latino adult patients from the Mountain Park Health Center have volunteered to participate in the biobank. Each Sangre Por Salud Biobank participant contributed personal and family medical histories, demographic, psychosocial and behavioral information, as well as blood samples.